Perhaps my best game yet. It placed 1st in a PDRoms competition and 2nd in a NeoFlash competition. 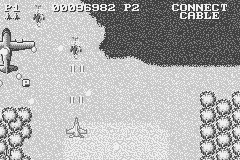 The PDRoms compo had a rule that restricted each scene to 4 colors only, hence the gameboy-ish theme. It's my first game to feature a full soundtrack complete with music and effects. Almost everything is created/programmed by me: game logic, graphics, sound/music engine (maxmod), the only exception is two of the music tracks which were written by a couple of my friends. Comes with source code! 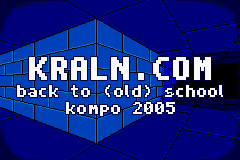 One of my older games developed for a Kraln.com compo. It's still mentionable though. 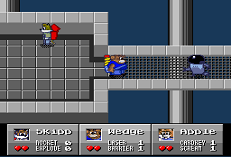 The gameplay is similar to Lode Runner; collect the rings and head to the exit while avoiding the bad guys. You can also pick up the red bricks and crush things with them! (or use them to cross pits). Comes with source code. An audio system for GBA and DS. It supports playback of MOD, S3M, XM, and IT modules. It's also written in 100% ARM assembly :). The successor to S3M2NSF. It converts IT files to NSF files. The IT files must have special MML data in the song message. The MML data describes how the instruments will sound (including duty envelopes and such! ), and the layout of the module channels. The program also has a special feature which generates 'preview' instruments inside an IT file so you can hear what you are composing. The instruments are multi-sampled at different octaves to have an accurate sound at any pitch. All of the NSF expansion chips are supported! S3M2NSF is a tool that converts special S3M files into NSF files (NES music file). It was created by me and Juan Linietsky in cooperation. There are two templates provided, one of them allows the VRC6 expansion to be used. Be sure to create delicious NES music!! 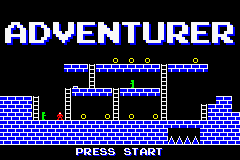 Comes with source code (C & 6502 asm). 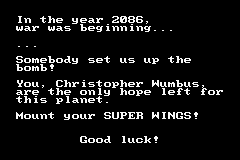 An SNES game I wrote for a PDRoms competition (#4.01). It's programmed in 65816 assembly, including some C/C++ for some tools and SPC700 assembly for the sound driver (SNESMOD). It came in 1st place out of 8 entries. An SNES sound driver. It plays IT modules (limited) and supports streaming sound effects. It can also do direct IT->SPC conversion. An XM player for SNES. This is discontinued and maybe broken. Hello world with poor MSPaint graphics! Maybe I will make a real GBC game someday. A command-line utility to convert tabs to spaces. It reads the Windows clipboard data, converts the tabs to a specified number of spaces (with proper alignment mid-line) and then writes the data back to the clipboard. I have a button in my QuickLaunch toolbar that runs "tabconv 4" so I can easily convert my code before putting it on a pastebin site. My public SVN is located at svn.mukunda.com. It contains the sources for my most recent projects.